On the first week of school in 1979, thirteen year old Oliver “Boo” Dalrymple dies in front of his locker while reciting the periodic table. A shy, socially awkward aspiring scientist, Boo wakes up in Town, a bit of heaven populated by thirteen year olds. A few days later, he is joined by his classmate Johnny, a friendly popular boy who reveals that both he and Boo had been killed by a school shooter. Despite technically beginning with death, Boo started out almost whimsically. 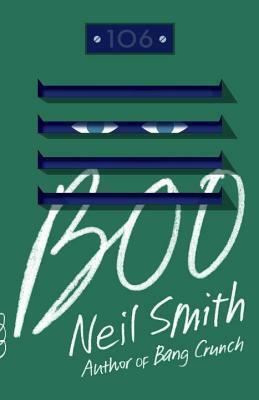 It was fascinating to see Neil Smith’s vision of heaven for thirteen year olds, and it was great to see Boo, who was friendless on earth, fitting in with the other souls in Town. There’s something reassuring about having an afterlife that’s so similar to our own world, yet there’s also something disquieting about how the old souls (thirteen year olds who’ve been in Town for decades) act older (some of the female souls are referred to as “mothers), yet are still kept childlike in some ways, dependent on god (called “Zig” in Boo’s narration) to provide the basic necessities. Once in a while, something discordant arrives, like a photocopier, and the teens are left to wonder what Zig wants them to do with it. This foray into a thirteen year old heaven is what I expected when I began the book, and if it remained on that storyline, with perhaps a romance or two sprinkled in, I would have called Boo charming, a fun, entertaining read. But the story gets darker, much more disturbing than I expected from a YA book, and so much more powerful because of it. It begins with Johnny’s revelation that he and Boo were killed by a school shooter, who had then killed himself. Then the question: what if “Gunboy” had been reborn in Town as well? Haunted by nightmares of the shooting, Johnny becomes obsessed with this possibility, and takes Boo with him on a quest to track down their killer. The story then turns into a very Lord of the Flies type tale, with the Town residents cobbling together their own law enforcement and justice systems. In the afterlife, what could possibly be a fitting punishment for murder? And how far can a desire for revenge go before it descends into madness? The search for Gunboy and the ensuing trial are among the book’s most disquieting scenes. The Town’s other murder victims see their own desire for justice in Johnny and Boo’s situation. In a particularly chilling moment, while discussing what to do with Gunboy, someone mentions that the other murder victims don’t just see Gunboy, they see their own murderers and abusers, the people in their own lives who caused their deaths and towards whom they are powerless to exact revenge. And still the story progresses beyond this Lord of the Flies stage. We eventually do learn more about Gunboy, but more than that, we learn about Boo and Johnny and the lives they led before these were so violently cut short. We learn about inner demons, voices in people’s heads who say things people don’t want to hear. We learn about loneliness, and alienation, and all the things that at thirteen, we desperately want to believe “gets better” over time. And above all, we learn about friendship, about the power of a kind word to resonate with someone even beyond death. Ultimately, I’m not sure what to say about Boo. It’s such a textured, multi-layered story, and I feel that if I read it again, I will parse something new each time. There’s not much going on in the plot, yet so much more happening between the lines, such that any pithy phrase I’d choose to describe it feels inadequate. I don’t even know how I feel about this book. I just know that it made me think, and that several days after I’ve turned the last page, I’m still thinking. This entry was posted in Book Reviews and tagged 50BookPledge2015, Random House Canada, YA by Jaclyn. Bookmark the permalink. Saw this book the other day and wondered if it would be to my taste – having read this review, it’s going on the nightstand! Thanks Jaclyn.